“Mr. Robot” debuted in 2015 as a captivating and uncanny reflection of not just our fractious times — all those eerie parallels with real-world events — but also of the isolating effects of technology billed and sold as a means of connection. The story was to our world as Mr. Robot was to Elliot: A darker, (somewhat) angrier version, with a mysterious agenda born of deep pain. Then it folded inside itself in Season 2, testing viewers’ patience as it burrowed into Elliot’s inner struggle to reconcile his splintered selves. (Unsuccessfully, as it turned out.) His overlong prison interlude and the trials of Angela and Darlene nicely broadened what had been a narrowly focused story about a troubled hacker, but they also raised a question: Could “Mr. Robot” get far enough out of its own head to recapture some of the fun that made its first season so intoxicating? Based on Wednesday’s Season 3 premiere, the answer seems to be a qualified yes. I say “yes” because Bobby Cannavale’s mustache, alone, was more delightful than anything in Season 2 — which I liked, for the record — aside from the sitcom segment and perhaps Elliott’s Adderall montage. I say “qualified” because the show seems to be venturing into metaphysical realms that could undermine the techno-political urgency that makes it feel so essential. We’ll get to that in a minute, but first back to the mustache. We opened on Mr. Cannavale as Irving, a used-car salesman and all-purpose Dark Army fixer who cleaned up Tyrell Wellick’s shooting of Elliott, settling, it seems, any lingering mystery over whether Wellick is a figment of Elliot’s damaged psyche. In a measure of how much this show messes with you, I briefly wondered if Irving, too, was somehow an Elliott projection. But it seems clear that he exists in the world, as does Wellick. More surprising: So does Mr. Robot, in a way. In Season 2, Elliot seemed to reach an understanding with Mr. Robot, only to be shot for trying to defy him in the finale. 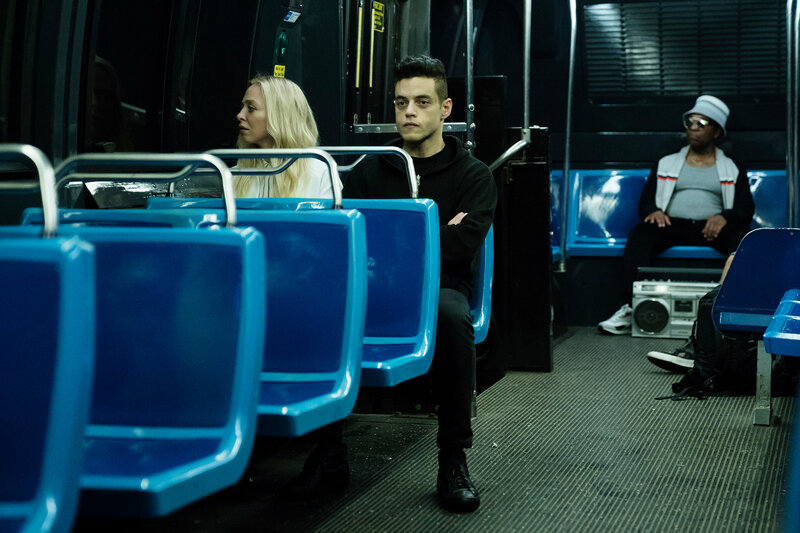 In the new season, the show seems to have synthesized the two sides of its personality more successfully than Elliot has, externalizing his existential struggle and placing Mr. Robot, as roguishly portrayed by Christian Slater, directly into the global disruption narrative. Elliot heroically dons the hoodie and descends, via a 4-plus minute Steadicam shot, into the frenetic hacker Olympics in order to close the backdoor that would enable the Stage 2 destruction of Evil Corp’s hard copy archives. Then later Mr. Robot meets back up with Wellick to seemingly devise a workaround. Which is to say, last season’s lackluster chess match has expanded into Elliott aiming to outmaneuver himself on a broader scale, with many lives and the fate of civilization in the balance. Will this contest also end in a stalemate? Perhaps, but whatever the resolution, it’s worth taking a second to consider how audacious it is. “Mr. Robot” was hardly the first story to hinge on a multiple personality plot — “Fight Club,” in particular, has been a polestar for the show’s unchained-id-raging-against-the-corporatocracy sensibility. But this season’s apparent Jekyll-and-Hyde dynamic asks viewers to accept two different actors playing the same person interchangeably, from moment to moment, and mostly pulls it off. Elliot is still clinging to the hope that Mr. Robot is finally gone, perhaps killed by Wellick’s bullet. But his doppelgänger aside, Elliot doesn’t realize how utterly alone he is. Darlene is pestering him for details — What is Stage 2? Is Wellick involved? — to an extent that points to a deal with the F.B.I. Angela, the person who knows him “better than anyone,” he says, is deceiving him in order to work with his alter ego in pursuit of Whiterose’s mysterious objectives. Darlene, coming ever more unglued after the death of Cisco, her murder of Susan Jacobs and the revelation that Agent DiPerro is on to fsociety, seems keen to renounce her criminal past. Angela, meanwhile, seems determined to reset the universe. “When we succeed, a whole new world will be born,” she tells Mr. Robot. These sentiments refer back to the early scene in the premiere at the E Corp Washington Township power plant, which finds a scientist musing about parallel universes as Whiterose, in her Minister Zheng guise, and an associate walk past. After she extols Elliot’s father’s “great engineering work that led to our early successes,” she cryptically explains why Elliot is crucial to her agenda. “We may possess the necessary tools, but what we don’t have is his unadulterated, focused rage,” he says. The camera then pulls back to what looks (to my admittedly untrained eye) like the sort of particle collider that real-world physicists think might uncover parallel dimensions. Could Whiterose, who yearns to close the gap between who she is and who she has to be in public, be trying to unlock dimensions in which that might be possible? Recall that she told Agent DiPierro last season that contemplation of alternate realities “moves me very deeply,” and she has seemingly convinced Angela that it’s possible to undo the history in which her mother died. Such a notion also gibes with the show’s overall obsession with duality and parallel existences. In an interview, Sam Esmail, the creator of “Mr. Robot,” confirmed that Whiterose’s agenda does involve parallel universes. “Do they exist? And can she somehow find a way to harness that?” he said. A question for viewers is, do we want them to exist? While I’m sure any wild metaphysical detours would be based in actual theory, and have plenty of faith in Mr. Esmail’s ability to render such themes, “Mr. Robot” is at its best when its at least a little grounded. Even as the conflict between Elliot and his alter ego have taken on Gothic dimensions, much of the show’s power comes from its dark but plausible dystopia. Its much-noted hacking authenticity is lost on most of us, but its clear-eyed depictions of how insurgences warp and falter, and how corporations smoothly turn rebellion into commerce — note the fsociety souvenir stand — give the show, at its best, a frisson few others can match. Besides, I still have pertinent questions: How did the 5/9 hack actually go down? What happened to Wellick last season? Here’s hoping “Mr. Robot” illuminates its current reality a little further before uncovering others. • I laughed out loud at Elliot’s “Property of Josh Groban” shirt, borrowed from Angela. It was also a fun call back to her ex Ollie’s reminiscences about Josh Groban Night at the bar last season. The premiere suggested that Season 3 would have more humor than its largely grim predecessor (see also: the punch card exchange at the Red Wheelbarrow). • President Obama has been a cleverly edited supporting character in “Mr. Robot” from the beginning, so I was curious to see whether or how President Trump might show up, even though it’s still 2015 in the show. We didn’t have to wait long — Elliot’s rant about how the 5/9 hack backfired included a lament about “this dark future that I set into motion,” which led into shots of Trump and Teresa May. Mr. Esmail no fan of President Trump, discussed this further in the interview.